These banana macaroon sandwich cookies are filled with a decadent chocolate hazelnut spread and with just 5 ingredients, they’re so simple to make! Macaroons sometimes feel like a cheater cookie. Macarons, however, are a completely different story. 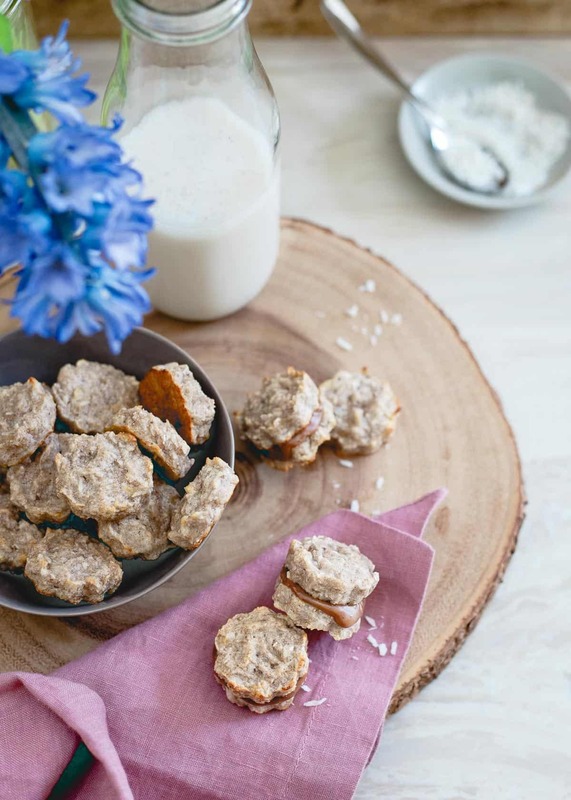 But throw that extra “o” in there and you go from impossible to so easy, I’m pretty sure my 2 year old niece could make them – like these paleo lemon macaroons or these blueberry chocolate macaroons. *Thanks to partner, Naturally More for sponsoring this post. And that’s precisely why I love them. If you’ve got coconut and eggs, that’s all you need. 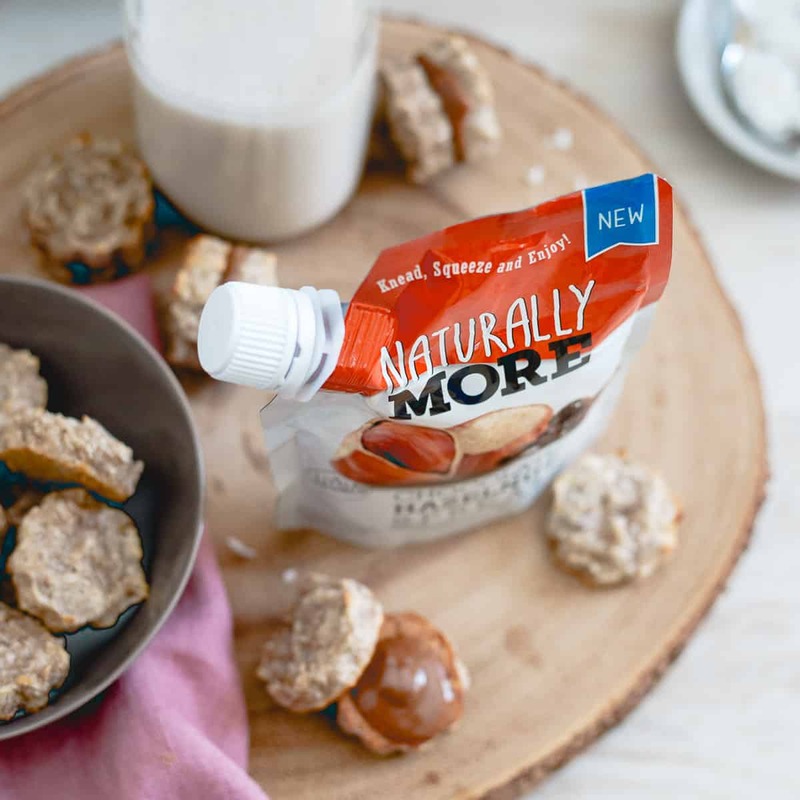 Pretty much just 2 ingredients stand between you and satisfying that cookie craving in the easiest way possible. Instead of using sugar with these banana macaroon sandwich cookies though I wanted to try out something different. With the plan to use Naturally More’s chocolate hazelnut spread between the cookies, banana crossed my mind. Because doesn’t banana, coconut and chocolate-hazelnut sound like one hell of a combination? It did in my mind at least. The new pouch packaging not only lends itself really well to these bite-sized sandwich cookies making it super easy to squeeze the perfect amount onto each one, but also makes it that much more convenient to take on the go with you whether it’s to work or just thrown in your bag for emergency snack situations like one does when panic ensues at the mere thought of ever being stranded without a snack option. When it comes down to it, I’m not sure I could choose between there being no added sugar (all the sweetness you need comes from the banana! 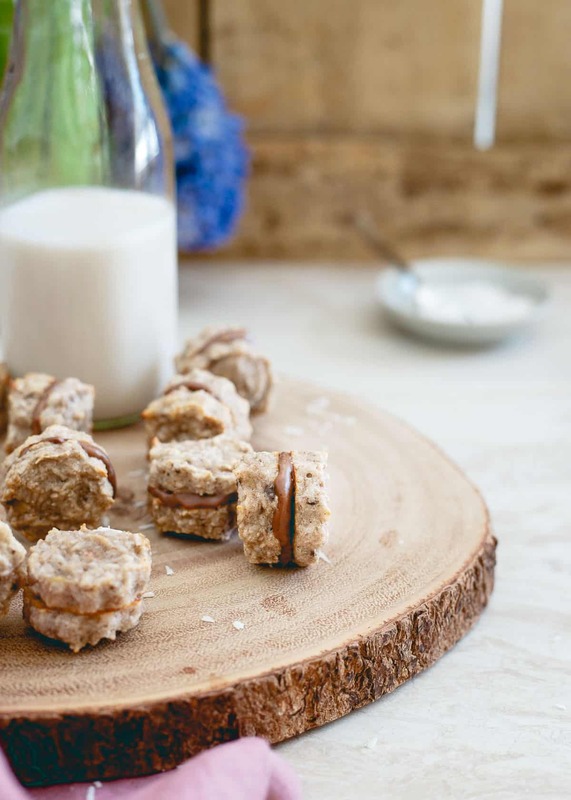 ), the delicious fudgy center, their bite-sized adorableness or the fact that there are literally just 5 ingredients as my favorite part about these banana macaroon sandwich cookies. Oh! And then there’s the added flax and probiotics in the chocolate hazelnut spread too. Throw that in the mix and they’re practically health food, right? So when you eat almost the entire batch during a 30 inch snow storm just days before spring is supposed to arrive, you tell yourself it’s no big deal. Love sandwich cookies? 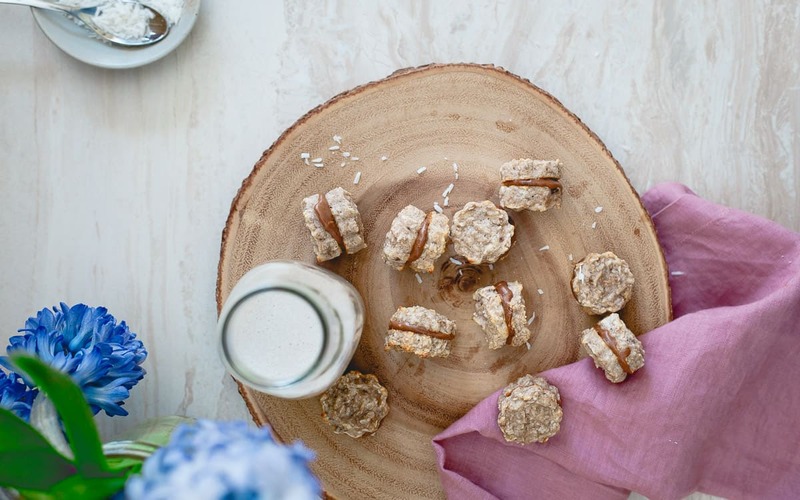 Don’t miss these no bake oatmeal raspberry sandwich cookies! These banana macaroon sandwich cookies are filled with a decadent chocolate hazelnut spread and with just 5 ingredients, they're so simple to make! Place the banana, coconut and cinnamon (if using) in a food processor and pulse a few times until combined. Transfer to a large bowl. Beat the egg white in a medium bowl with a hand-mixer (or do this in the bowl of a stand-mixer fitted with the whisk attachment) until soft peaks form. Gently fold the beaten egg white into the banana coconut mixture until combined. Place a small round cookie cutter that's been greased with baking spray on the baking sheet. Spoon mixture into the cookie cutter to form the cookie shape then remove cookie cutter. Repeat with remaining batter. Bake for about 20 minutes until cookies start to turn golden brown on the edges. Remove from oven, let cool for a couple minutes before transferring to a cooling rack. Once completely cooled, squeeze chocolate hazelnut spread onto one side of a cookie. Top with another cookie to form the sandwich and repeat with the remaining cookies. Place in the refrigerator for 5 minutes so the chocolate hazelnut spread sets. 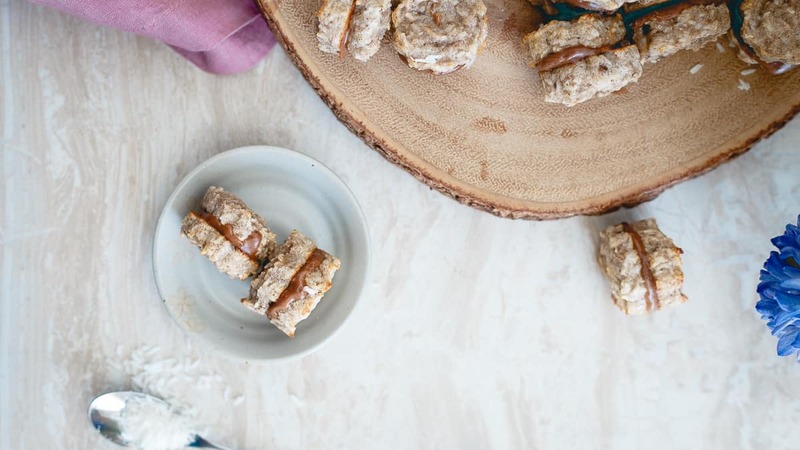 For strict paleo - opt for a straight up hazelnut butter or other nut butter spread. I can’t get over how easy and delicious these are!!! Hi Gina. Just wanted to stop in and let you know that a couple weeks ago I googled “how to build a food photography board” and landed on your site. Thanks so much for the information. Worked like a charm. I made a white and a blue and I’m so pleased with the results. And easy! With that said, man these little cookie sandwiches look good. 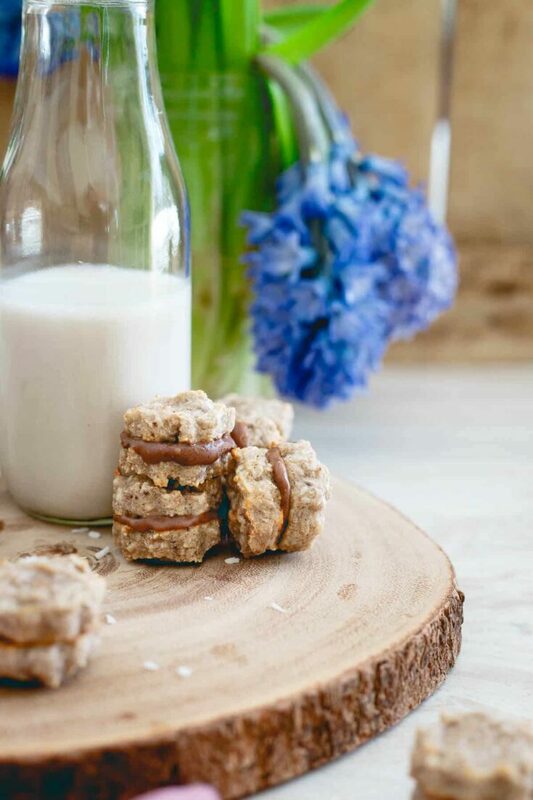 LOVE these cookies and love Naturally More peanut butter and almond butter with probiotics and flax! it’s my fave! Will check out their chocolate hazelnut spread! Love the flavor combo of these Gina! I haven’t tried Naturally More’s spread. I’ll need to look next time I go to the market. Love how easy these are too. These flavors are perfection!! Love!! That filling sounds amazing, love these little bites! These look so incredibly good! Love the filling. This is such a genius idea!!! These are so cute. I could eat a million of them.